Can you believe this? After the largest online protest in history, the Obama administration is still voicing support for SOPA! For those who are not following SOPA (Stop Internet Piracy Act) fiasco, it is deemed by many as a form of internet censorship. On January 18, 2012, the English Wikipedia, Reddit, and an estimated 7,000 other smaller websites coordinated a service blackout, to raise awareness. In excess of 160 million people viewed Wikipedia’s banner. Other protests against SOPA and PIPA included petition drives, with Google stating it collected over 7 million signatures, boycotts of companies that support the legislation, and a rally held in New York City. So, what is the White House working on exactly? Just the other day, the OBAMA ADMINISTRATION sent a letter to Congress to demonstrate their SUPPORT for new INTERNET CENSORSHIP legislation. A few weeks ago, the White House struck a deal to give corporations private powers to shut down your internet connection (after “six strikes” without due process or judicial review), completely in secret. Our goal? 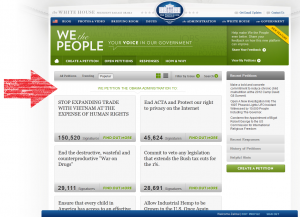 Get more signatures than the top petition on whitehouse.gov — 151,000 signatures.